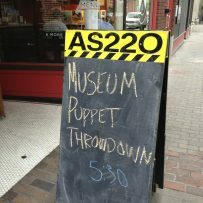 Here’s the idea: invite people to Providence’s awesome bar/restaurant/nonprofit gallery, AS220, and give them a space to sit down, have a beer or glass of wine, and make puppets based on popular Providence museum exhibits. 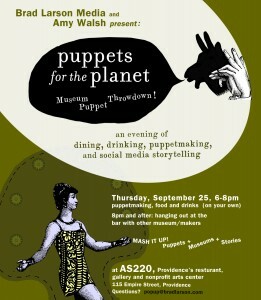 This year — the 2nd Annual Museum Puppet Throwdown — has a theme: “Puppets for the Planet.” We’ll be creating spontaneous puppetshows on the theme for upload to YouTube via Storykiosk. Appearing again this year will be Nori the Dragon from Providence Children’s Museum as well as puppets from other Providence museums. For an overview of last year’s event, you can check out this blog entry. See you there! Details: Thursday, 9/25, 6pm to 8pm. No charge other than incidental food and drink. Can hang out after. AS220, 115 Empire Street, Providence. Google Map.